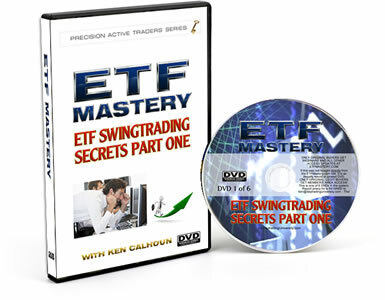 Learn how to day & swing trade popular ETFs. You’ll Discover How to Swing & Day Trade ETFs In This Popular Bestselling Classic Course Featuring Ken Calhoun! If you like keeping your trading life simple by specializing in trading just a handful of strong-moving ETFs, then this can be one of the most important trading messages you’ll read all year. If you don’t have a lot of time to scan for different stocks to trade constantly, then trading the ETFs (which trade exactly like stocks) can help you trade the broad market indexes, or specific sectors instead… keeping it easy to trade. Knowing how to trade ETFs is a “must-have” trading skill that can give you a huge advantage — because they don’t gap up or down significantly overnight (unlike stocks), reducing your risk… plus they are widely traded on high volume. 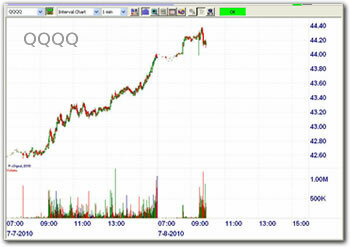 This liquidity makes them perfect for both day and swing trading, once you know how it all works. Perfect for Active Day and Swing ETF traders! This classic 6-video system has been created from a series of very popular webinars I did for my Daytrading University traders in 2010 and is definitely a “must get” system for your trading library. 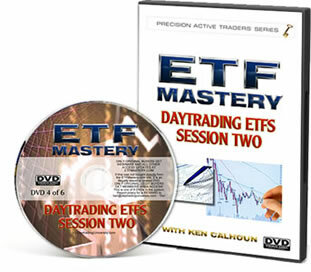 You’ll be impressed at the thoughftul accuracy and detailed instructions (with dozens of chart examples) you’ll be learning from in ETF Mastery. The tactics are ideal for our current 2017 markets as well — it’s all about patterns that repeat. It’s ideal for day and swing trading, as it covers examples of all styles, including both single and triple-leveraged 3x ETFs for active traders. You’ll want to study it carefully before putting on your very next trade, because it can help you learn how a trader with many years of real trading experience trades the ETFs… and now it’s your turn. What’s the “Edge” That ETF Mastery™ Delivers? Your ETFMastery™ Advantage: I’ve tested out hundreds of strategies with small-share trades in my own trading accounts so I’ve SHOWED You how to potentially use the same strategies for yourself, once you order your ETF Mastery system today. Why Trading ETFs In Addition To (or Instead of) Stocks Can Give You A Big Potential Trading Advantage — Fast! That’s right…if you check the charts for top-traded ETFs like SPY, QQQQ, FAZ, FAS, DXD, QID and others, you’ll see that I’m right… there’s never any significant up or down gap from one day to another. Usually, the ETFs will make minor gaps up or down depending on the premarket futures direction; I teach you how to leverage this important “trading gap” pattern in the ETF Mastery System. I’ve put my own real money on the line regularly with real trades — and I’ve tested out my techniques for using the ETFs as a core part of my trading portfolio, because I like to swing and day trade the ETFs every week. 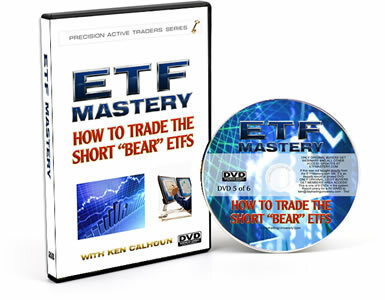 Now I’ve finally gotten it down to the point where I feel comfortable releasing this ETF Mastery 6vVideo trading system to show you exactly how I really trade the ETFs. Trading ETFs Can Help Simplify Your Trading Life… Because This “Scan-Free” Strategy Is Easy! As a working day and swing trader, I am constantly scanning for which stocks are breaking out. 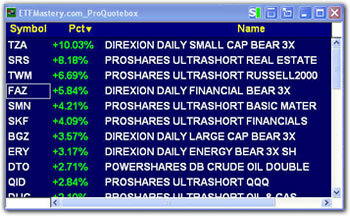 One thing that simplifies my trading life considerably is that I put my ETF tickers into their own portfolio quotebox, which makes it much easier to see “what’s moving” each morning. On days where I don’t have the time or energy to manually scan through hundreds of stocks, I can still always trade my ETFs, because I know their ATRs (average true ranges), pivot areas… and more importantly, my new proprietary entry and exit signals, that are easy to spot once you know what to look for. It’s a great way to still be in the market and trade, even just swing trading, because knowing a handful of 5-10 ETFs and how to trade them, is all you need. 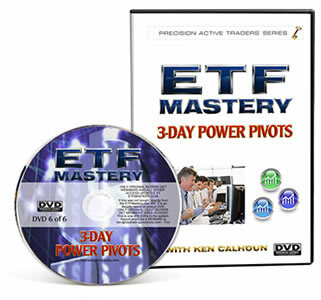 You’ll be learning how it all works once you order your own ETF Mastery system. In working with thousands of traders since 1999, I’ve found that there are subtle, yet powerful differences between those traders that “get it” and have a better potential for becoming successful, and those that do not. You’ll be seeing how I include these differences of how to trade the different chart patterns, revealed exclusively in the ETF Mastery trading system…. The entry and exit strategies you’ll be learning about in ETF Mastery have been given to you “on a silver platter”, because they’re easily explained using fully-explained videos, so you’ll see how it works, fast. And we don’t use an overwhelming flood of indicators that cause confusion and missed entries. Instead, you’ll be shown exactly how to look through the top ETF charts anytime you want to put on a trade, and how to set your entries, exits and stops explained step by step, so that you can see “over my shoulder” how to trade these for yourself. …in fact, I’ve distilled years of knowledge working with many traders into a “blueprint” you can use to help guide your own trading activity, explained so that it all makes sense. It’s just that good, and can potentially help make a big difference in your trades, as it accelerates your learning for step by step ETF trading. Where to set stops, what patterns work best, and how to target the highest-probability ETF entries during an entire market open. Real trades entered and exited, with brokerage “over the shoulder” POV/point of view footage captured from my trading workstation, so you’ll see exactly how to manage your ETF trades like an experienced trader. How to buy and sell the short ETFs for day and swing trades during times where the market is selling off. Strategies for combining candle patterns, cups and multi-day charts for easily scanning to set your entries and exits. How to enter and exit ETF trades inside 3-day round trips for volatile and choppy ETFs. Countermeasures to avoid false breakouts. Step by step trade management “trading plan” tactics to use for entries, stops, exits and position sizing using this powerful new trading technique. Traders, I look forward to sharing useful tactics for helping you learn trading strategies in this popular course. Go ahead and be sure to order right now. You’ll value this professional trading course! Click below to enroll today, one easy payment of just $197, which includes all 6 ETF Mastery downloadable videos for you to keep – you’ll get instant access once you order. industry pro, to help you see exactly how to swing & day trade ETFs. This is a standalone video download course; no webinars or alerts are included. and is lower-resolution SD format taken from our dvds: 850 x 480 pixel .wmv videos. to see what the course videos look like. You get over 8 hours of videos! Course Right Now. We’ll See You Online… Let’s Trade!